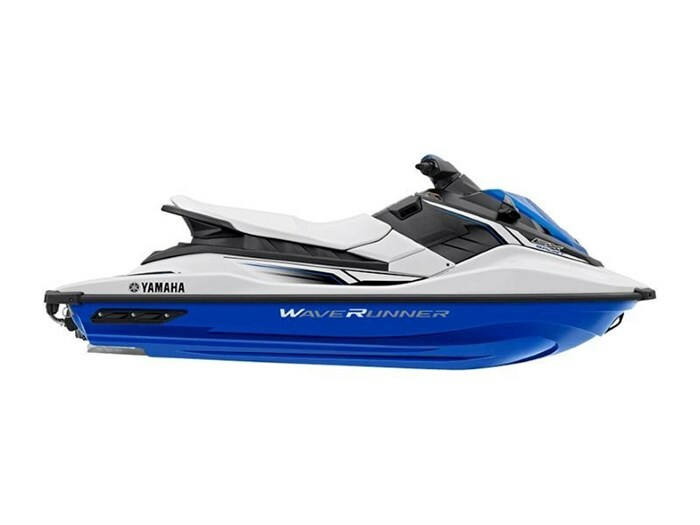 2019 Yamaha Ex Sport CONQUER WATER Welcome to Generation EX® - the line of entry-level WaveRunners that delivers endless fun on the water. The EX Sport is feature rich and accessible, featuring Yamaha's award-winning, lightweight, 3-cylinder TR-1 engine and mechanical reverse. TR-1 ENGINE This award-winning, lightweight 3-cylinder engine brings a fun ride with maximum fuel economy. DUAL MIRRORS Standard dual mirrors provide increased visibility for towing. REBOARDING STEP Reboarding made easier with a step that tucks away easily when not in use. Features may include: POWERPLANT TR-1 four-stroke marine engine. The EX is powered by Yamaha's award-winning TR-1 three-cylinder marine engine that is 40 percent smaller in size, 20 percent lighter in weight and provides better fuel economy than Yamaha's previous four-cylinder Yamaha MR-1 engine. Electronic Fuel Injection (EFI): Delivers a smooth, high power output with low fuel consumption and low exhaust emissions. JET PUMP PROPULSION SYSTEM Cooling Water Intake Filter: Filters out harmful debris that could cause blockage of important cooling water passages. Pumps are Manufactured with YDC30: A combination of zinc and copper alloys, developed by Yamaha marine engineers, that offers excellent corrosion protection. ULTRA-LIGHTWEIGHT, HIGH STRENGTH HULL AND DECK The EX hull is designed to be light and strong. Under the waterline is an all-new hull design that is manufactured to precise tolerances. This lightweight SMC hull delivers excellent stability for one, two or three-up riding and towing, and precise responsiveness and predictability for thrilling one-up riding. Progressive, V-Hull with Integrated Bow Spray Guard: Provides excellent maneuverability, handling and comfort.